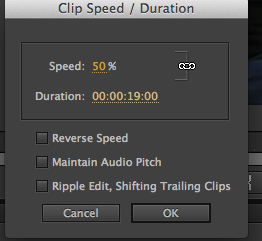 One neat trick I learned in my video editing experience in the past was how to make a slow motion effect . It helped me create a dramatic effect in the video I was making. This could be something for you all to try! Now don’t think I would teach you how to make your video slower and not teach you how to make your video faster as well . We will learn that too, but let’s start off with slow motion. 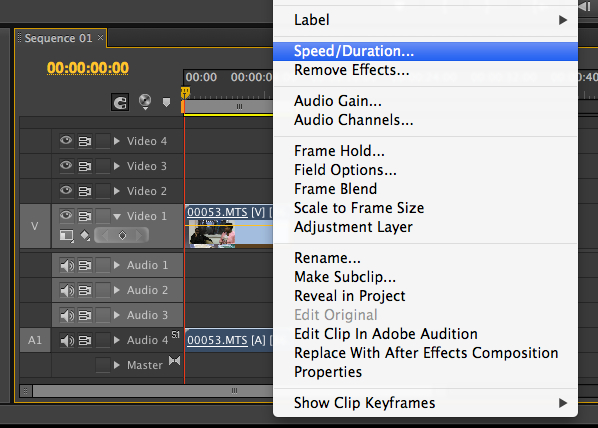 Step 1: Find you clip on your timeline and right click on it and select Speed/Duration while using the selection tool. Note: If you use windows just right click , but if you are using a mac press control + click. Speed :When you first open the box the percent at the top will be 100%. This means your speed is going the pace it was when originally downloaded. 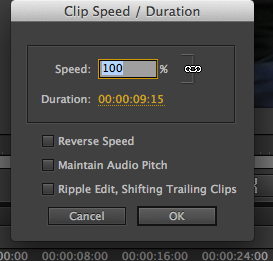 Duration: Duration tells you how long your clip will play for when you add it to your sequence. If you want your clip to play at half the speed it was originally there are a couple of ways to do it. 1. Toggle your pointer over the duration drag and drag it to the RIGHT until you reach around 50%. You drag it to the right because you want to increase the duration, thus making the clip slower. 2. You can just type in 50% by double clicking the speed percentage and writing it in. Lastly, press okay and the speed will be applied to the clip. You can pick any number you want as long as it is less than 100 hundred your clip will be slow. This is super easy, now that you have read the first part of this tutorial. To produce fast motion you follow Steps 1 and 2. However for Step 3 , instead of using a percent smaller than 100 you will use a percent larger than 100. Just like before you press okay and your effects are added. To see the final project play the clip by either pressing the space bar or pressing the play button located under your video. Surprise: You can do the same thing for your audio clips! Just right click the audio clips and go through the same process. ~ by catchmeonfifth on March 3, 2013.